So I'ma be straight up and say when I do my makeup the first thing that goes on my face is a primer, I have no time nor do I really care for moisturiser at 7am/8am in the morning when doing my makeup, infact it could be 2 in the afternoon and I still wouldn't put moisturiser on before doing my makeup. Why? Well frankly because the effort and time and ugh, just leave me sit on my bed watching Netflix while I slap some products on my face..but not moisturiser..obviously! 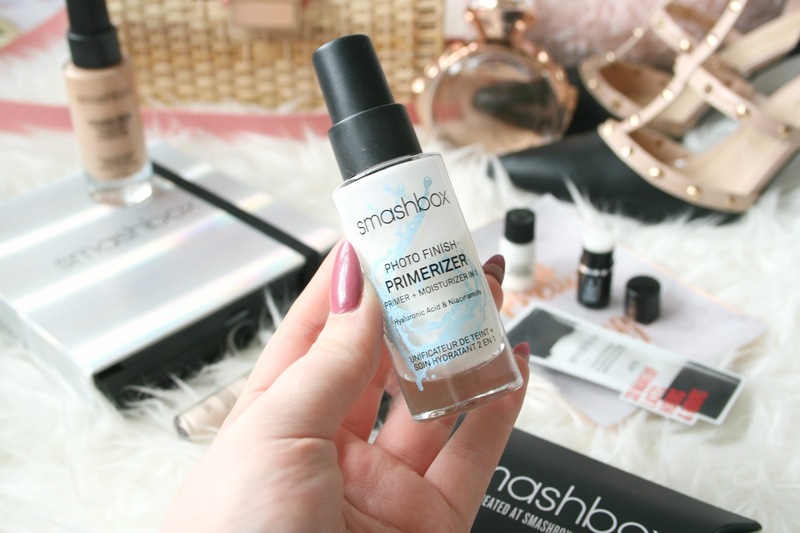 A few weeks back (or maybe it's months now I'm not too sure) Smashbox released their Primerizer, a product containing a primer and a moisturiser all in 1. Meaning you can either skip the moisturising step or like me if you never bothered with it, technically you're putting moisturiser on while using this. Smashbox is my go to brand for Primers and to be honest I don't really want to count how many Smashbox primers I own because I already know it's too many. Although they are a tad expensive I always spend more on primers because well you get what you pay for and Smashbox have yet to release a Primer that I do not like. The Primerizer itself contains Hyaluronic Acid and with the craze around that at the moment I'm all for it, like literally anything that says it contains Hyaluronic Acid I'm just like yep thanks I want 5! The bottle design I must admit I love it, at first when I bought it I actually thought that little blue line was going through the actual product but it's not, it's printed onto the bottle. The product inside is just white but it's the best thing ever! Using 2 to 3 pumps of product, depending how generous you want to be simply apply it to your face as you would a primer. I will say this is the most loveliest primer I've ever tried and I'm guessing it's because of the moisturising element in it. Sometimes my skin can get very dry in certain areas such as around my nose and sometimes over my lip. However since purchasing this it's the only primer I've been using and I have not noticed a single dry patch on my face since starting to use it. The actual primer part of it is just as good as every other Smashbox primer I've used and it helps keep my makeup on throughout the day! This was brought out replacing the Hydrating Primer which I ended up buying two tubes of as a backup just so I have them (see this is my problem) but it's definitely just as hydrating! I've been using this since it was released and I've barely made a dent in it, theres so much product and because I only use 2 pumps (a little goes a very long way) I know it's going to last a long time! If this sounds like something that you'd use but don't want to commit to buying the full sized product before trying it make sure you go to your local Smashbox counter and ask for a sample! Have you tried the Smashbox Primerizer yet? Heard loads of good things about this, sounds perfect for my dry skin in winter! I love the idea of this so convenient! Gorgeous photos here Jordan! So glad you like this primer so much, great to hear that a little goes a long way! This is such a cool idea for a primer. Have never tried any Smashbox primers but I hear nothing but great things! oooohhh I've never tried the smash box primers, in fact I haven't tried any of them! The looks sooo good, I think I need it!